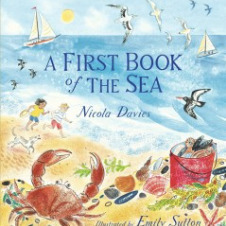 This book is filled with short poems about the sea. I found the illustrations engaging and learned some new things, such as when a mother otter needs to hunt for food she will tie her baby in seaweed, so it does not drift away. Some students may not be able to relate to the poems since many have never seen the sea. Tags: 2018 Children's Nonfiction, LeeAnne Grover, Marine Animals, Marine Ecology, ocean, Ocean Poetry, Poetry, Sea.